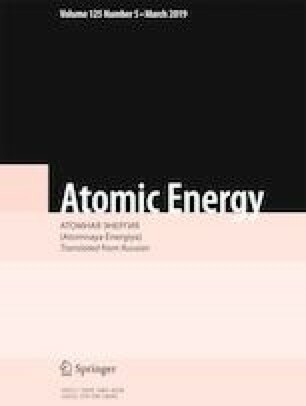 The BONUS model of the formation, radioactive interactions, and transport of fission products in nuclear fuel is modified to describe the behavior of hydrogen and helium in irradiated nuclear fuel as well as to accumulate an expanded list of transuranium actinides. The program module developed on the basis of the model is included in the MFPR/R fuel code and the SFPR and the BERKUT-U fuel rod codes. The test calculations for mixed uranium-plutonium oxide fuel and mixed uranium-plutonium nitride fuel irradiated in fast reactors are in good agreement with high-precision neutronics calculations. Translated from Atomnaya Énergiya, Vol. 125, No. 6, pp. 327–331, December, 2018.